Nearest: Tube Station: King"s Cross St Pancras 264 yards (241 metres), Railway Station: London Kings Cross 0.17 miles (0.3 km), DLR Station: Tower Gateway 2.5 miles (4 km), Motorway: M1 Junction 1 5.5 miles (8.8 km). Within just 0.5 miles (0.8 km) there are 4 overgound railway stations and 4 tube (underground) stations. The Wardonia Hotel is perfect for combining excellent transport links, affordable area and close vicinity to central London. This particular area is very popular for tourist class hotels. These are no frills bed and breakfast hotels typically housed in converted rows of Victorian former residences. Please note that the Wardonia does not offer breakfast. While Kings Cross itself isn't the most pretty of places for visitors it is on the edge of the most sort after locations such as Bloomsbury, Holborn, Oxford Street, Piccadilly Circus and Soho. All within a mile and a half of the hotel. On your doorstep are three of the big 5 London stations, Kings Cross, St Pancras (both within 5 minutes walk) and Euston (10 minutes walk). All within walking distance. The British Library is within a couple of hundred yards. There are plenty of amenities in the surrounding areas including pubs and cafe style restaurants. Within half a mile are the Shaw Theatre (0.2 miles), The Fondling Museum (0.2 miles), The London canal Museum (0.4 miles), Dickens House (0.4 miles) and the Bloomsbury Theatre (0.5 miles). The Wardonia Hotel offers basic accommodation at affordable rates for the London visitor. Free wireless internet access means no worrying about data charges for your laptop. Services such as luggage storage are an added convenience and the hotels reception is open 24/7. Bedrooms are compact and come with tea/coffee facilities, iron a television (with digital channels) and hairdryer. They also have private bathroom facilities (small shower and free toiletries). An open space with hangers if provided as well as a desk. Compared to other London hotels: This hotel has been rated 74% by past guests. The London average is 80% and the average for 2 star hotels is 68%. Therefore while the hotel is below the overall London average you should note that this hotel is above average for its sector (star rating) . Milesfaster ranking: 663rd from 866 London hotels, and 29th of 70 two star rated hotels. Another to Consider: Also close by and a similar hotel (0.0 miles, 0.1 km) would be the 2 star Hotel Meridiana, whose lowest rates start at about £65 and which has a 75% guest satisfaction rating. The Hotel Meridiana also offers: free WiFi. Looking for lower base rates? Then another option might be the Generator Hotel. 0.2 miles away (0.3 km), has scored 74% from former guests and whose lowest rates start at about £16 (theres free WiFi too). Would you prefer to go with something that has scored higher in guest satisfaction ratings? If that is what your after then the 3 Star Arosfa Hotel Bloomsbury seems like a possible option, it's only 0.6 miles (1.0 km) from here. A highly rated hotel with a guest score of 89%. 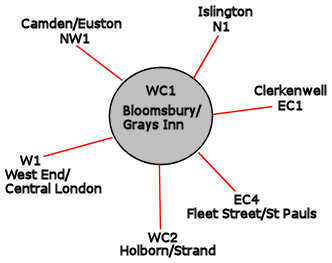 The fifty hotels that are closest to this location (46-54 Argyle Street, WC1 postcode) which we list extend for a 0.6 miles (1.0 km) radius. Consisting of 3 five star hotels (average rating 89%), 17 four star hotels (average rating 82%), 20 three star hotels (average rating 76%), 8 two star hotels (average rating 71%) and 2 one star hotels (average rating 62%). Top 2 star hotels are Crestfield Hotel and the Generator Hotel (both 77%). Of the 50 local hotels top rated is Montague On The Gardens Hotel (4 star) at 99%. Base Rates: We show you the average starting rates (base rates) in the area and break it down by star rating. Trouble with this is that base rates do not include special offers and limited low rate deals. However they remain a useful guide to general rates. The average base rate when considering all hotels in the surrounding area is £96 per night. Starting from £16 at Generator Hotel (2 Star, 77%) with top rates of £222 at Renaissance St Pancras (5 Star, 89%). Rate averages listed by star level: Five Star average: £193, Four Star average: £119, Three Star average: £85, Two Star average: £47 and One Star average: £53. We rank hotels based on their guest rating but balanced for their influencing factors. We have ranked Wardonia Hotel 36th (joint) of 50 nearby hotels and 4th for the 8 two star hotels in the area. Our ranking for sheer lowest base rates is 23rd of 50 (8th of 8 two star hotels.). We calculate an overall ranking combining the rates and rating scores. This hotel ranks 31st of 42 for pure value for money (Generator Hotel was top).